I can get obsessed with specific restaurants. It's a useful problem to have in this line of work. If I like a place, I'll return again and again until I tire of it. In rare cases, the obsession doesn't end. I still haven't lost my passion for La Bottega di Finestra, perhaps the finest cafe in the city. I've lost track of how many times I've been there. 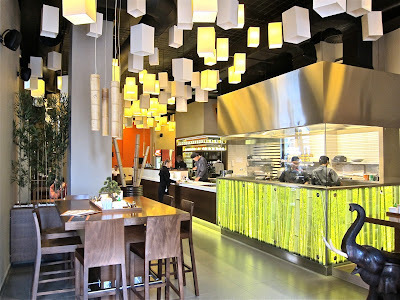 Asian eateries are well-represented on my short list of regular favorites, so when I saw the new Zebra Asian Noodle Bar on Havelský trh, I quickly got curious. For those not familiar with Prague geography, the restaurant is located between Old Town Square and Wenceslas Square. Both the menu and the interior reminded me of Coa. I had high hopes for that place, but they didn't pan out. Zebra also has an open kitchen, a variety of table and seating choices, and a bright, modern feel. Zebra is smaller inside, but it has quite a few al fresco tables under an arcade. 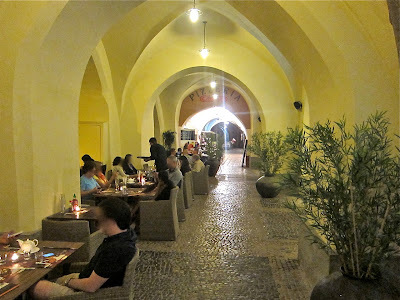 I'll tell you right from the start: I became obsessed with this restaurant. These passions usually fade after three or four visits. I've been to Zebra six times since it opened this summer. Rather than break down each visit, I'm going to go through everything I tried on their menu in one straight shot. The first thing I went for was the Zebra wings. They were fried with a crunchy coating and covered with a sweet and savory orange glaze. Some could find it too sweet. They appealed to my sweet tooth, reminding me of the guilty pleasures of Chinese fast food in the USA. One unappetizing aspect was that they revised the menu recently. Some tasty dishes were dropped, a few others were added, and they raised the prices. When they first opened, they charged 89 CZK for six Zebra wings. Now they've soared to 139 CZK for eight. A number of offerings went up in cost by between 10 and 60 CZK. 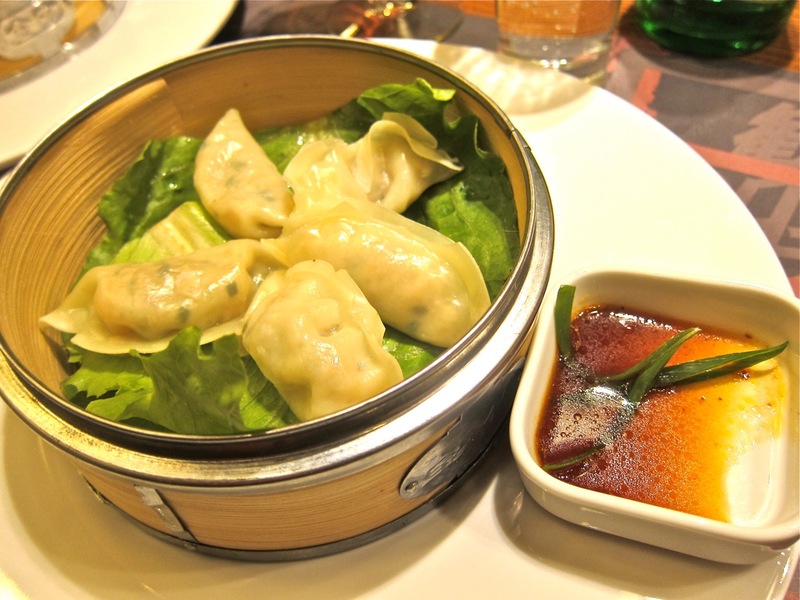 We tried the vegetarian dim sum (99 CZK). 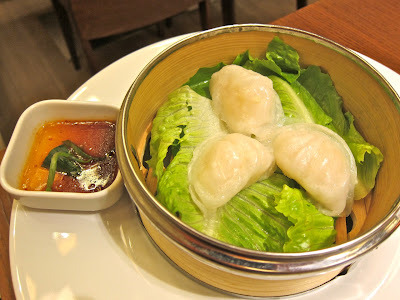 The five delicate dumplings were filled with tofu, bok choy, mint, leek, and Thai basil. They come with a terrific, tangy dipping sauce. This was ordered on many visits. They also have shrimp dim sum (119 CZK). 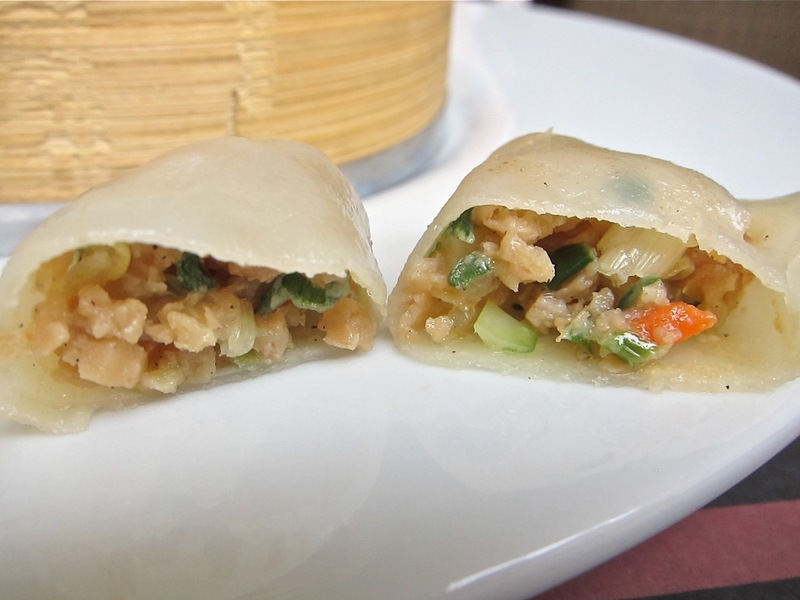 These three dumplings filled with chopped shrimp also had the satisfyingly moist, thin skin. The dipping sauce was the same. While not bad, we preferred the veggie dumplings. I was curious about the Vietnamese roll (169 CZK). Of all the things I tried, this was the only one I considered a failure. The waiter told me it was fried, but it was only lightly griddled. The menu says it is filled with shrimp, avocado, shallots, and mayo. While I could see some of those things inside, all I could taste was a large amount of mayo and some celery. A sweet mustard sauce sat on the side. 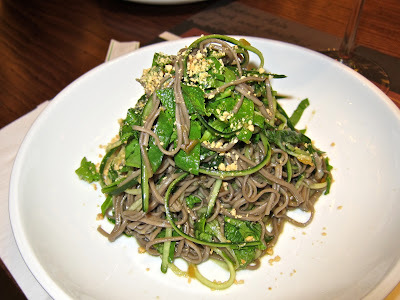 We enjoyed the cool and refreshing soba salad (179 CZK). The buckwheat noodles were combined with fresh spinach, mint, peanuts, and a light vinegar dressing. You will also feel some garlic. An alternative is the green papaya salad (169 CZK). 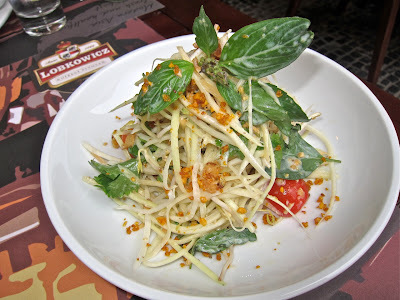 This was a handful of crunchy papaya mixed with cherry tomatoes, spring onions, sprouts, and peanuts. 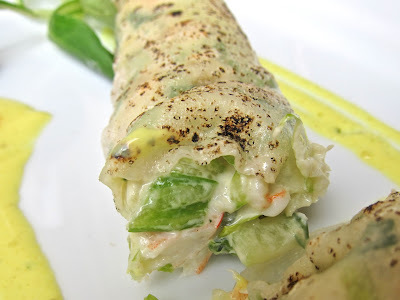 The tart dressing included lime and fish sauce. Nice. Two soups I really loved, the corn with coconut milk and the Five Treasures have dropped off the menu update. I won't tease you with the pictures. They still have the tom-yam (179 CZK). This type of hot and sour soup is not usually made with coconut milk. Some variations are made with a small amount, but this version was much more like a Tom Kha Goong. Either way, the large bowl was loaded with glass noodles, calamari, shrimp, and shiitake mushrooms. The seafood was fresh and well-complemented by the lime leaf and fish sauce, plus with a slow-building heat. It was very filling by itself. I sampled my Thai litmus test dish, the Pad Thai with shrimp (249 CZK). I'd rank this one second only to the version at Noi, which is still my favorite in the city. The noodles had layers of flavor that ran from tangy to smoky to salty to nutty. There was a bounty of shrimp in there. I counted 12. Though not large, they were cooked just right to a delicate and still tender state. 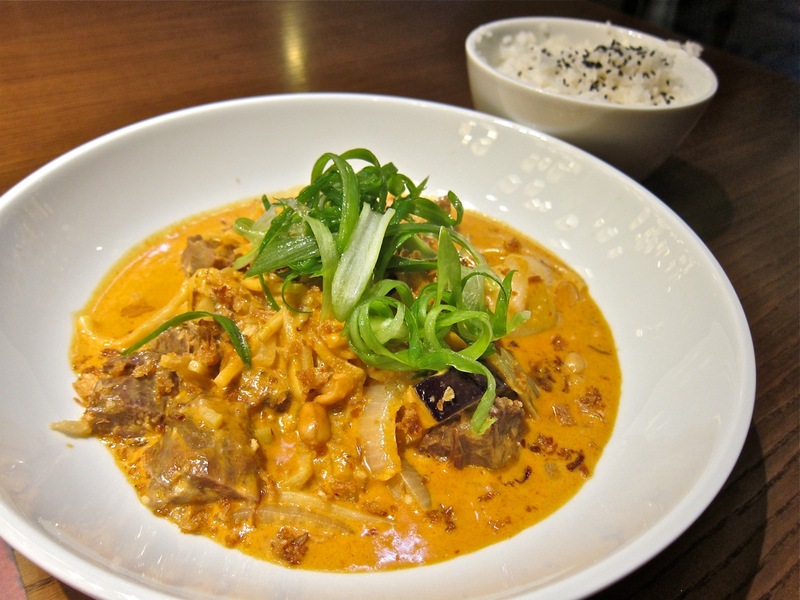 Continuing with the Thai theme, there's the massaman curry with beef (249 CZK). Rice is included in the price. In my recent story about Občanská plovárna, I was talking about my desire for thicker, creamier curries in Prague. This is exactly what I was talking about. It's my wish fulfilled. 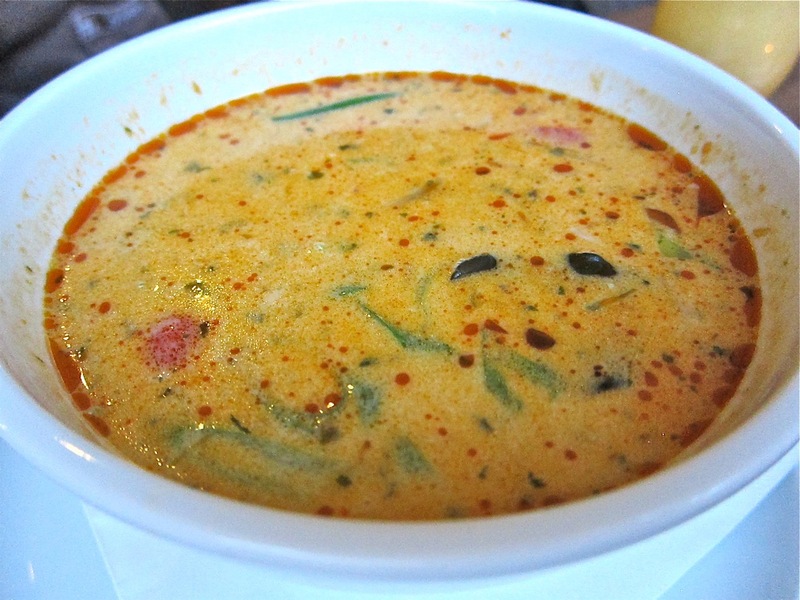 Thai curries are usually thin and soup like. 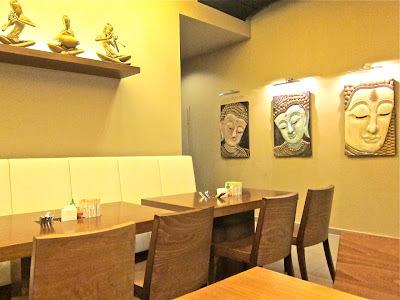 The exceptions are panang and massaman curries, which can be creamier and more Indian-like in their consistency. In this one, chunks of beef were slow-cooked to softness. 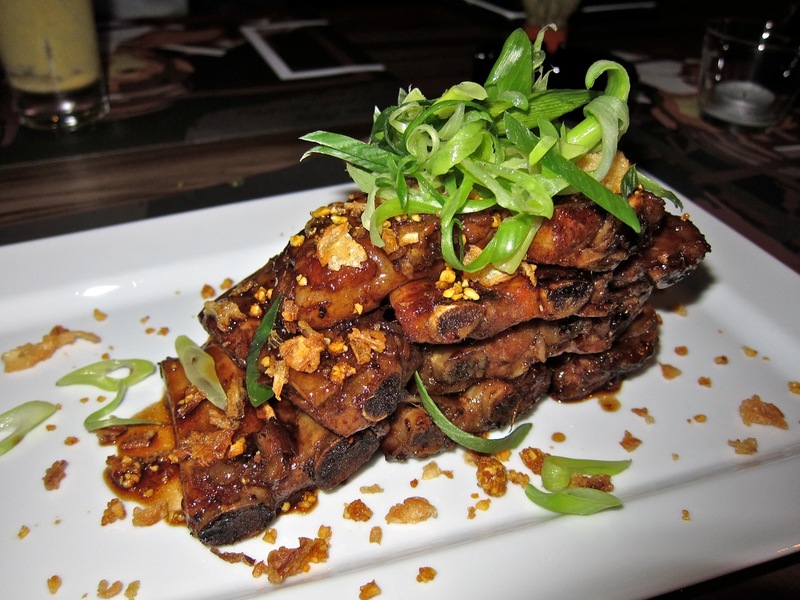 The meat was surrounded by eggplant, potato, white onion, green onion, and peanuts. The spiciness built up slowly. It was a little too salty for me, but otherwise great. 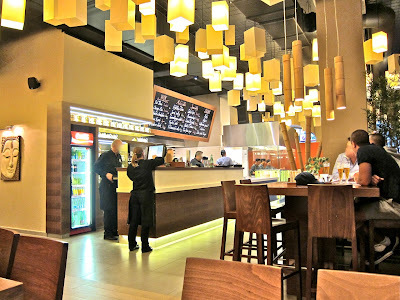 If you like that one, you might want to try their "Chang-Mai" noodles (249 CZK). Their homemade egg noodles were covered in a thick, red curry coconut sauce. 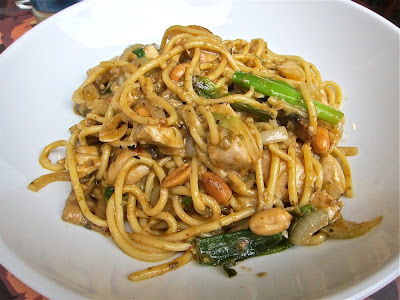 There was also tender chicken, coriander (cilantro), green onions, white onions, peanuts, mushrooms, and eggplant. 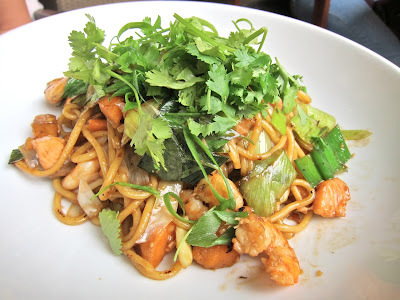 Continuing with the egg noodle theme, they have a Japanese dish they call Kuni salmon (249 CZK). This included shrimp, yams, leeks, and oyster sauce. The shrimp were excellent again and the yams had a mild sweetness. 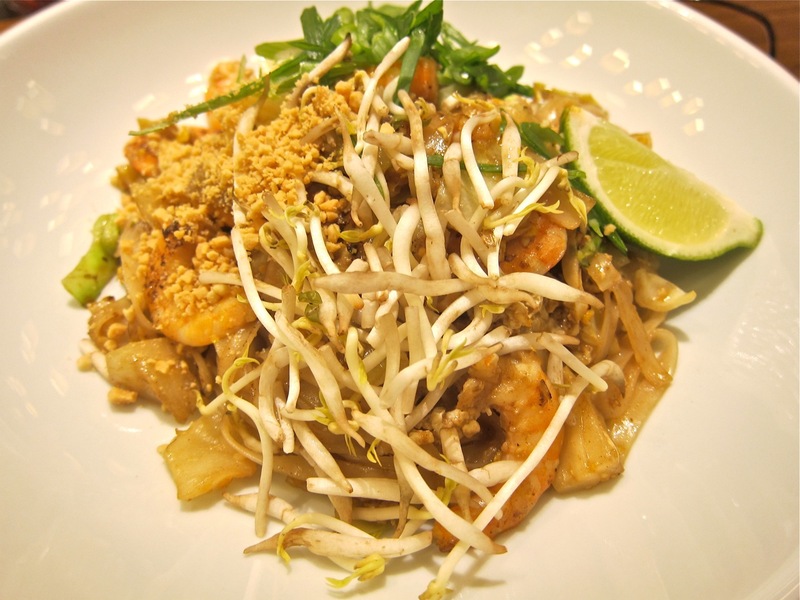 Overall, it had a strong flavor of Thai basil supplemented by the large amount of fresh coriander on top. I did hear one complaint that there weren't enough of the small pieces of salmon. I'd note here that they were accommodating and prepared this once without salmon on request. Another time, my date asked if they would make a vegetable stir fry, which was not on the menu. They were happy to do so, and she was happy with their creative effort. 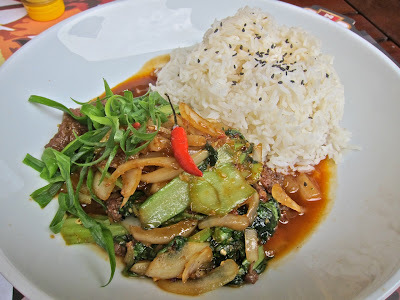 From the Chinese portion of the menu, I ordered the Sichuan Beef (279 CZK). The tender beef slices were mixed with a sweet and seriously spicy sauce. There was also bok choy, green and white onions, and what tasted like Thai basil. Rice came with it in the bowl. The last of the main courses was the pork ribs (249 CZK). 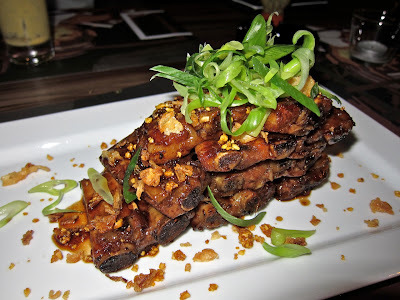 These baby backs were not as tender as the American style ribs at Mood, but they were still easy to peel apart with fingers. Although the menu said they have a "sweet and spicy glaze," I found them more salty than sweet. And I thought they were great. 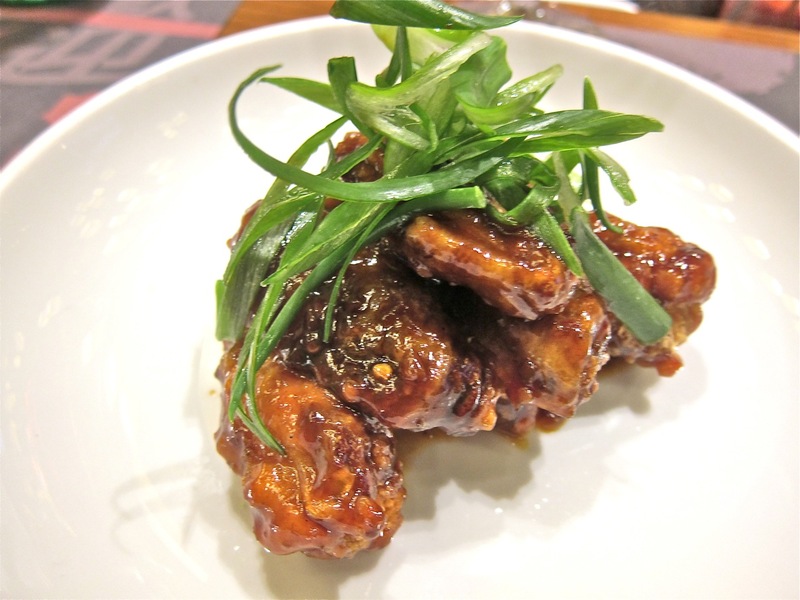 The flavor brought me back to London's Gerrard Street and New York's Chinatown. It wasn't exactly the same, but close enough. 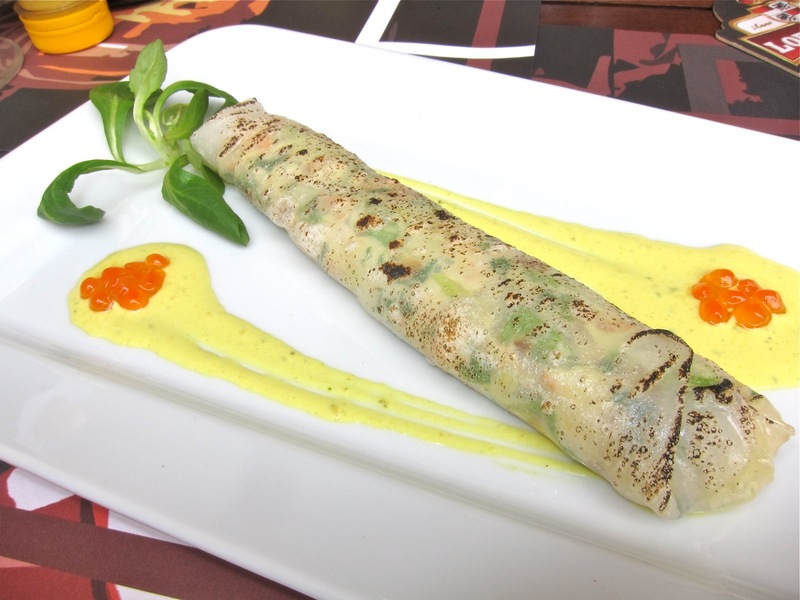 On the last visit, we tried the two new and most expensive items on the menu. My date had the Zebra maguro (570 CZK). 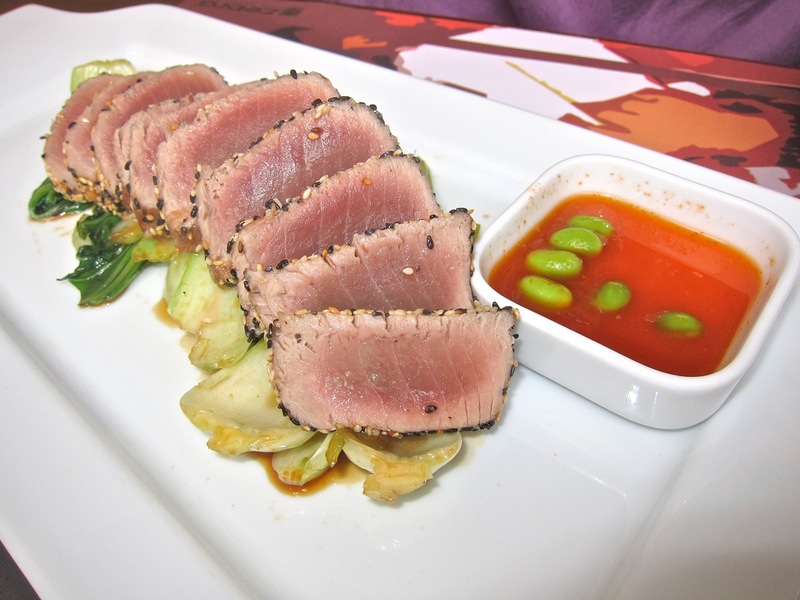 It was sesame-crusted seared tuna over bok choi cooked with soy sauce. We were guaranteed it would be served very rare. Although not quite as rare as we would have liked, it was still within our acceptable range. There was a sour yuzu sauce on the side. My date liked the tuna. I thought it was OK, but I'd say it didn't satisfy my price to pleasure quotient. 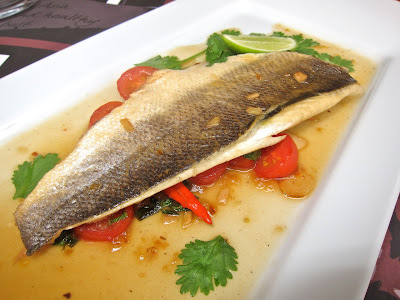 I had their Thai-style sea bass (490 CZK). Although I'm a big tuna fan, I actually like this dish better. The large, fresh filet rested on a very tart lime, coriander, and lime leaf sauce. There was also fried garlic and cherry tomatoes underneath. It might be too sour for some people, but I enjoyed the strong taste. Rice came on the side for both dishes, but it went less well with the tuna, which had very little sauce with it. 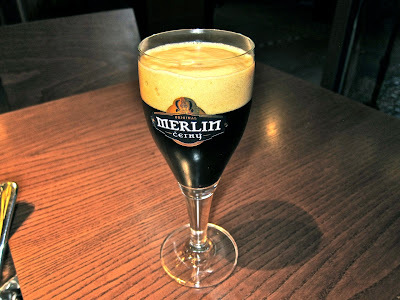 To drink, I most often had the .3 liter glass of Merlin dark beer (45 CZK). It was on the sweet side, with coffee and caramel notes. 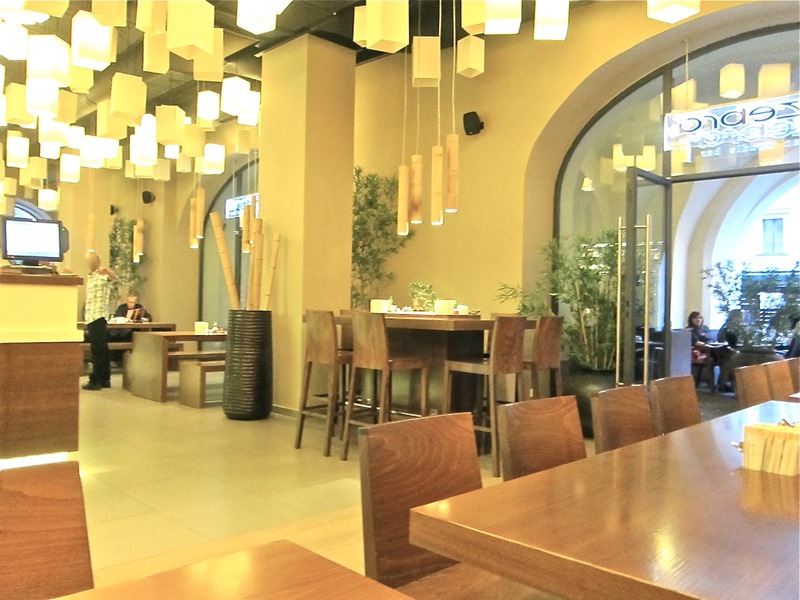 They also serve Lobkowicz Premium 12° beer, which I like as an alternative to Pilsner Urquell. 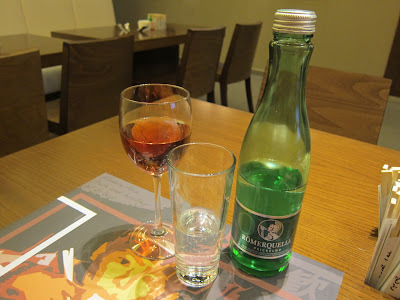 My date drank rosé (99 CZK) and a large bottle of Romerquelle sparkling water 85 CZK) on one visit. Her favorite beverage was their super thick, creamy, homemade mango lassi (95 CZK). As enjoyable as it was, the downside is that it is a very small bottle for a big price. They also have .25 liter bottles of BonAqua, which is not cheap either (55 CZK). 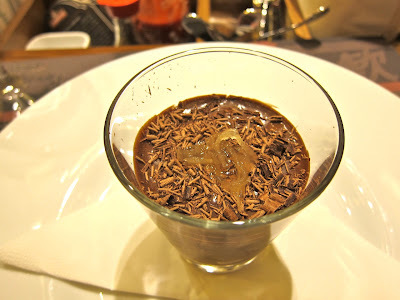 I did try one dessert: the marquise chocolate with ginger and orange (99 CZK). This was something akin to a rich chocolate mousse with candied orange peel. I liked it very much. What about the service? It was all over the place. There was a total melt down on one visit with two forgotten orders, incorrect charges on the bill and the like. On a couple of visits, the service was terse and impersonal. On another two, it was stellar. Our hyper-efficient waiter was as friendly and as sweet as their wings. I'd make some allowances for the restaurant being newly opened. The later visits did have better service. 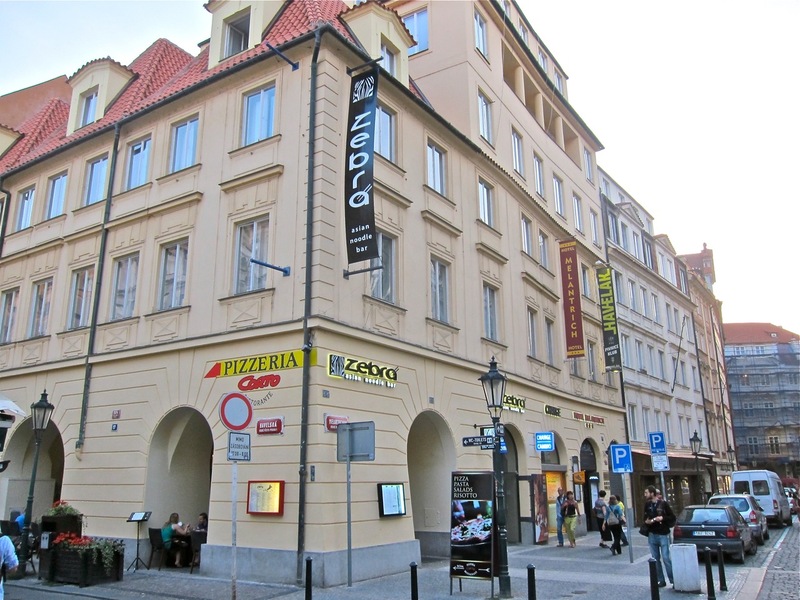 The location, at a crossroads of Prague's tourist trails, can't be cheap. The rising prices did take away some of the feeling of value. I thought the price for water was ridiculous. 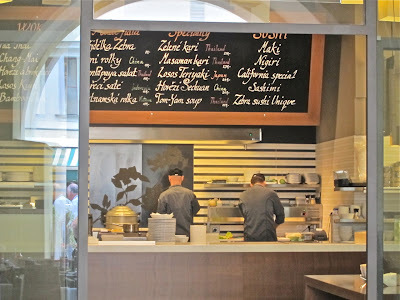 However, with many filling and delicious dishes going for around 250 CZK, it's still possible to eat at this restaurant and not go broke. 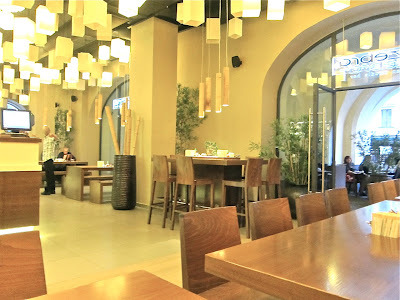 My meals for two with at least two courses and drinks averaged 1000 CZK. 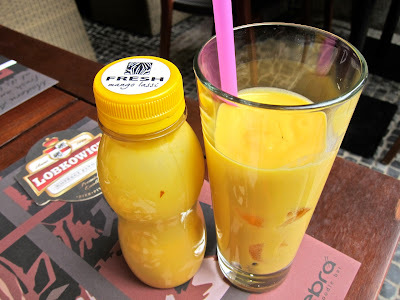 In the end, I became obsessed with Zebra because it presented flavors that were familiar to me and, at the same time, so unfamiliar in Prague. It's clear the people behind this restaurant have an international perspective and did their homework. 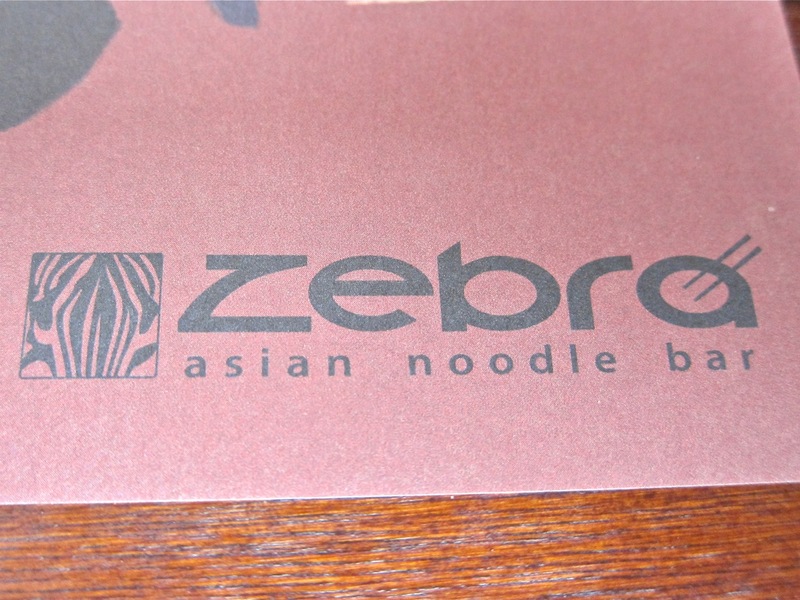 Although not gourmet or groundbreaking, Zebra brought back memories of simple, but satisfying meals in London, New York, Los Angeles, Beijing, and Thailand. For me, food like that is hard to forget. I am surprised this is the only Chinese you reviewed! (According to your blogroll tags). Have I missed or have you never been to Huang He? 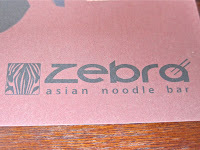 Zebra is not really Chinese. It is more of a fusion place with some Chinese dishes. I've been to Huang He. I live in Vrsovice -- walking distance. I thought about writing about it a few times, but never got around to it. But true -- I never really wrote up a Chinese place.